The Far and Mid North Coasts of New South Wales has the best beaches of any location in the world (and I defy anyone to show me better). This section of coast covers a length of coastline from the Queensland border to around Forster, just a few hundred kilometres north of Sydney. This spectacular section of coast runs about 600 kilometres and there are fantastic headlands and islands that make the coast one of the most popular areas in Australia for tourists. Byron Bay is such an area of the coast. Named in 1770 by Lieutenant James Cook, RN, commander of HM Bark Endeavour, after Lord Byron (well, he actually named the headland Cape Byron), Cape Byron is the eastern-most point of the Australian mainland. One of the dives at Julian Rocks is the Cod Hole. The Cod Hole is actually a small arch that on one side forms a hole. More about it later. 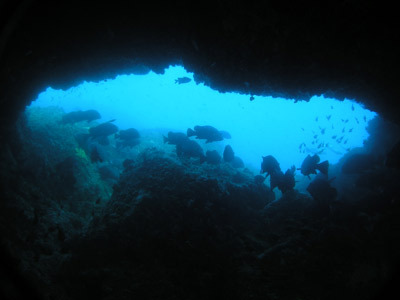 This dive is generally called the Cod Hole but a better name would really be The Shark Gutters as this is where all the action is and most time is spent. The dive normally starts at The Nursery mooring or thereabouts. From here you head west to the sand edge and then north. 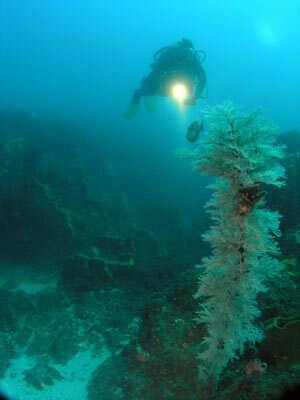 The depth gradually deepens from 13 metres to 20 metres as you head north. After 75 metres or so you will come to the shark gutters. These are created by a series of large rocks off the main reef. These gutters are about two or three metres high and up to 10 metres wide. The gutters are home most of the year (it used to be mainly only Winter and Spring) to grey nurse sharks. During my dives in late May 2008 we saw about 14 sharks here. There were probably more, but the visibility was a bit down so we could not see too far. 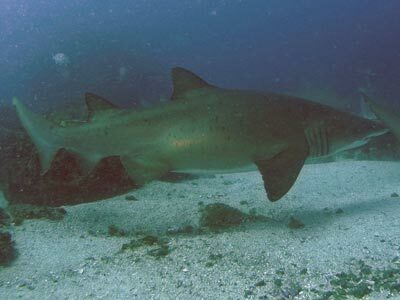 Most of the sharks were males, but there were some very large females, one of which was huge. The sharks parade up and down the gutters, circling from the northern end to the southern end and back again. The best way to view them is to set up on one of the rocks and watch the sharks as they go past. The sides of the rocks and the main reef have lots of nice growth, including black coral trees. These are especially prominent at the northern end. From the start of the gutters, head north or north-east along the gutters. In this area we also saw lots of very large snapper, with a large school of Jewfish up over the main reef. After another 50 or so metres the depth has increased to 22 metres. This is probably as far as you will get as there is still lots to see on the way back. From here you head back to the east to the main reef (if you are out a bit). There are more black coral trees here. Once back at the main reef, go up it for a bit and you may see large schools of barracuda (and the Jewfish if you have not already seen them). Follow the reef edge back to the south-west and you will soon come to the Cod Hole. The view will be similar to the photograph at the top left. Once inside the hole, you will probably see lots of fish, possibly luderick, blackfish and similar. You may even be lucky to see a huge Queensland groper (cod) that lives here (this is presumably where the Cod Hole got its name). There are also turles in this area, at least one of them is very large. You can exit out the back of the hole and head over the reef for a while till you get back to the reef edge or continue to the south. 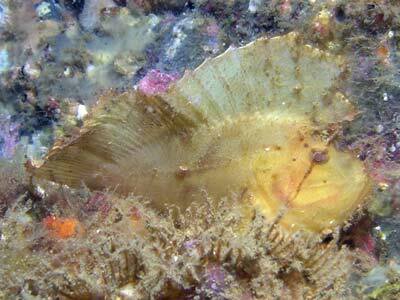 About 30 or so metres south of the hole we found a leaf fish (shown to us by Sue the Dive Master). The reef all the way from here back to the mooring is covered in wobbegongs. Some of these are the dwarf species, only discovered in mid-2000s to be a separate species. 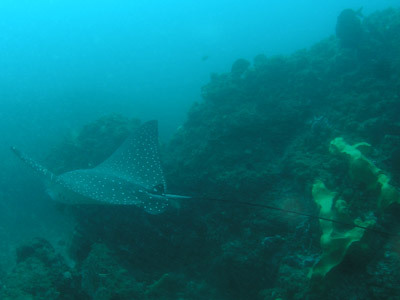 As you go, keep an eye open for eagle rays which can often be seen swimming low over the reef. On our two dives here in May 2008 we saw three. 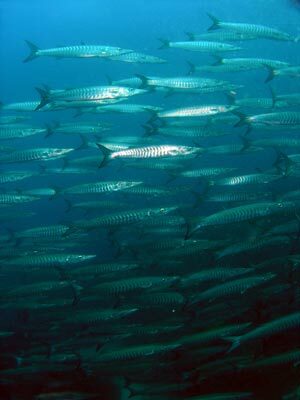 On the reef itself there are great things like nudibranchs and up higher you may see large kingfish. 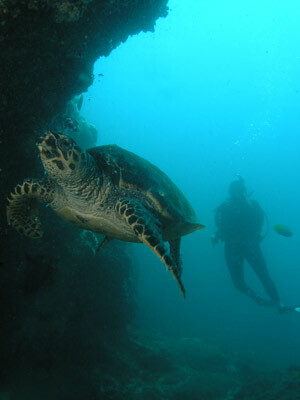 This is a great dive, one of the best you will do in New South Wales. 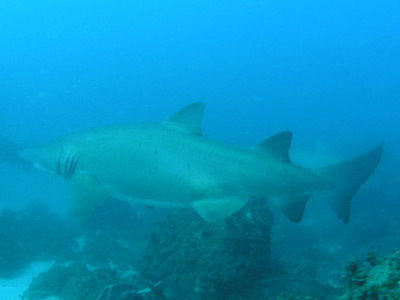 If the water conditions are good and sharks present, you will have a brilliant dive.